Stuff we’ve found in the archive that is exciting to us. A program for NATE’s production of “Foghorn” and “Coyote Tracks” at La MaMa (1973) in which the group explains their recent name change. La MaMa Archives. A letter to NATE from a Rough Rock school teacher, March 1973. The writer explains that NATE’s performance was “one of the nicest things that has ever happened at Rough Rock.” La MaMa Archives. Materials documenting NATE’s work are now cataloged and will be findable through our digital collections portal, which is due to launch in Fall of 2015. There is one set of objects that we’ve cataloged but can’t, yet, offer up to researchers: a collection of 1/2 inch open reel videos documenting NATE’s performances both in New York and on the road. These videos are fragile and difficult to play back. We’re hoping to digitize them in the next phase of our Pushcart Collection project, so that we can begin to make them available to scholars and students interested in late 20th century Native American culture and politics, political theater, and the artistic communities that have been nurtured by La MaMa. His Wikipedia page doesn’t mention it, his official biography on the Milk Foundation website doesn’t mention it, but the La MaMa archives has proof: Harvey Milk was an actor in New York City before moving to San Francisco and beginning his political career. These biographies do mention that Milk worked as a production associate on Broadway shows like director Tom O’Horgan’s Hair, but what they miss is that Milk starred in several of O’Horgan’s productions off-off-Broadway at La MaMa, including Changes (1968) and The New OP-ra (1965). Amusingly, on at least one occasion he performed under the pseudonym Basil Farckwart, according to a handwritten note on the flyer to the left. Below is a photo of Milk (second from left) on stage during the July 1965 production of Three New Plays Directed by Tom O’Horgan. 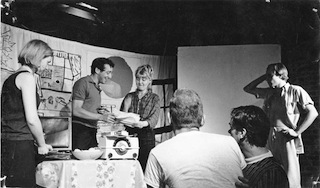 Harvey Milk (with Mari-Claire Charba, Marlene Fisher, Tom O’Horgan and others) on the set of “…And Now The Weather,” in July, 1965 at La MaMa’s 122 Second Avenue location. Photographer unknown. Here’s another one for the “famous people who got their start at La MaMa” files. In the program at left, take a look at Crystal’s first-ever theatrical billing (alongside a roster of La MaMa-stars), as Bill Crystal.